I’ve got the world’s easiest 2-ingredient All-Natural Autumn Appletini recipe to share with you today! Admittedly, I’m not a big fan of the Appletini you would order out at the bar. It’s loaded with icky ingredients that are NOT natural and give it that lime green color and fake apple taste. Well, friend, you can rest assured no strange ingredients are found in this drink. Although the leaves are starting to turn, it’s still pretty toasty here in the south, so I’m still going for cold beverages over hot drinks. This all-natural Autumn Appletini is the perfect cool cocktail to celebrate fall and enjoy the seasonal flavor of apples. Plus, I’m super excited to share that this drink is made with some delicious local vodka made from sweet potatoes and corn in Wendell, NC. Honestly, I’m really impressed with the taste of sweet potato vodka. It’s slightly sweeter than most vodkas with a lighter, crisp flavor that I love by itself - shaken or in a cocktail. John & I took a trip to Wendell to meet with owner Lee Browne to talk about Boots Vodka and check out the inside of Oaklee Distillery Co. The inside of Oaklee Distillery is awesome. 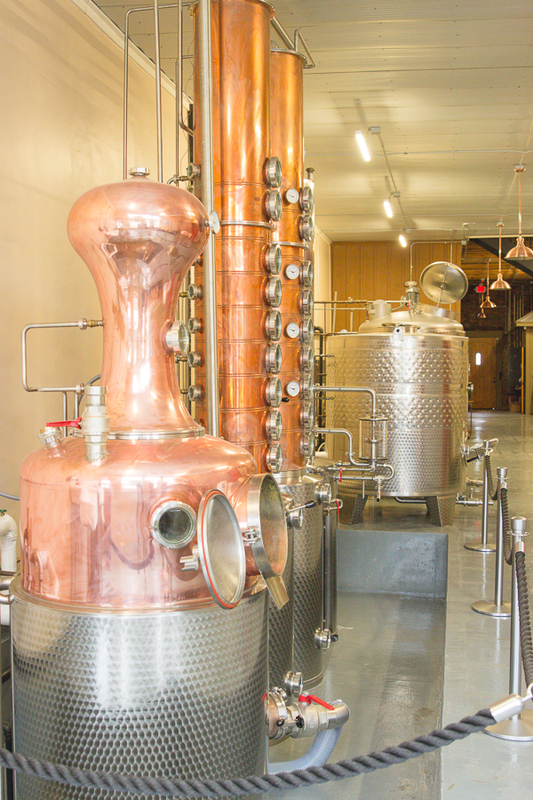 The huge distilling machinery is nothing short of magnificent. 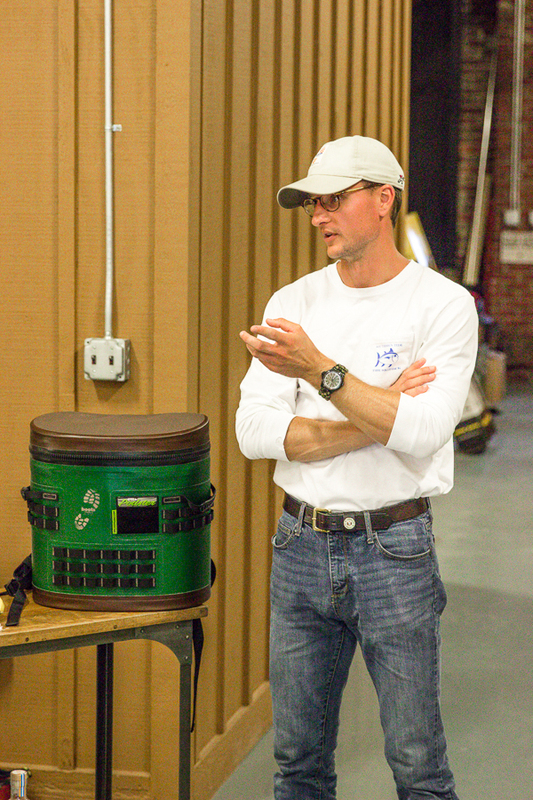 It was so inspiring talking with Lee about the story behind the vision of Boots and Oaklee Distilling Co. I learned that Lee was dreaming up big plans for Oaklee Distilling Co. when he was in school at the University of North Carolina. A business plan on paper has now manifested into a tasty reality as he is producing Boots Vodka. 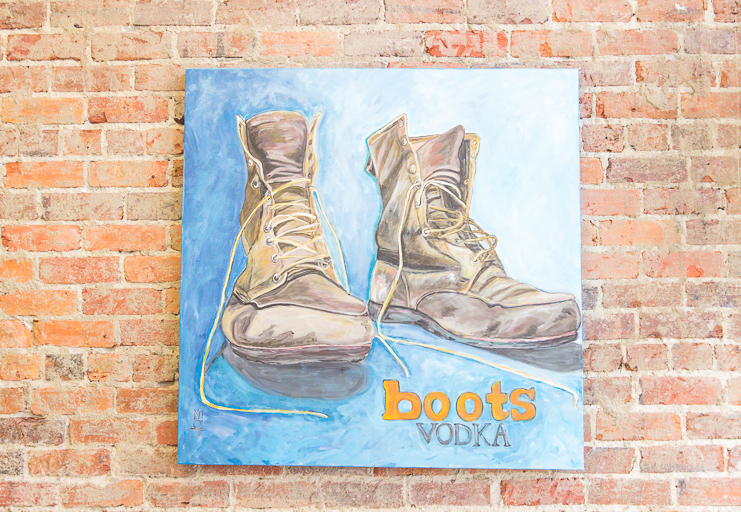 Boots Vodka is a unique spirit because it’s “troop proof”, boasting a 90 proof strength. Just a 1 oz. pour will be all you need for a satisfying evening martini! After one taste of Boots Vodka, I knew I was excited to try it in some cocktail recipes this fall. The sweeter vodka mixes perfectly with the acidic apple. Since you already know that I like to ease into fall flavors and not dive right into pumpkin spice-everything, apples and cinnamon spices are the perfect way for me to do this. If you’re hosting any type of fall-themed gathering or Halloween party, add this drink to your menu it’s so easy and sure to be a crowd-pleaser! Strain the drink into a chilled martini glass and garnish with a cinnamon stick for an extra flavor kiss. I made 4 of these for our friends in the middle of a board game and I was away from the table less than 3 minutes. We didn’t even have to pause the game or skip my turn! I was actually shouting from the kitchen while I was stirring up our drinks. Haha! Random side note - board games are making a come back, aren’t they? We’ve played everything from Ultimate Werewolf to Settlers of Catan and we’re really enjoying them. These strategy games take a little longer to play but they always end up in an evening of belly laughs with our friends. I used a filtered apple cider so that you could see the cinnamon stick and it wasn’t gritty. However, you could totally use the pure apple cider that hasn’t been strained. I’ve tried the drink with that apple cider as well and it turned out just as amazing. I also really like the spiced apple cider that we’re seeing in the grocery store lately and that would be awesome in the drink as well. You don’t have to add a cinnamon stick, but I like the extra flavor boost. You could add a dash of cinnamon powder to your Appletini but it will slightly affect the texture of the martini. If you choose to add a little cinnamon flavor in powder form, you could add it at the same time as the apple cider so that it mixes well into the drink and doesn’t sit on top of the final drink in the glass. I did try a few other fall flavor combinations with the Boots Vodka but my favorite by far was this All-Natural Appletini. I have a few other ideas of ways to expand on the apple cider & vodka combo that I’m working on now, so keep an eye out. If you didn’t know, I LOVE supporting local products, produce, and goods. If you do as well and you live in NC or the surrounding region, give Boots Vodka and my festive All-Natural Autumn Appletini a try! Have y'all tried Boots Vodka or made an amazing fall cocktail lately? Comment below and let me know what you think!